According to the 2000 census, the borough of Queens, New York has 138 spoken languages. That surprised me. And, it also got me thinking. We are a country that strives to make everyone’s life better, and dare I say, ‘pursuit of happiness’ is quite literally written into the fabric of this country. Yet the fight to make English our official language is often brought forth in a bill only to be quietly forgotten or immediately dismissed by the very people whom it would ultimately benefit. At any bank ATM, depending where you live, you will find many alternatives to English to do your banking. In NYC most banks have seven languages. (English, Spanish, Chinese, Korean, French, Russian, Portuguese). And whereas seven seems like a lot, it is hardly the 138 languages JUST in Queens. So, I ask myself, are we really helping everyone? And, the truth is that this is JUST banking, not the post office, department of motor vehicles,a local movie theater or the many, many other places one could be lost if they don’t know English. Is the answer to make everything we see and do available in hundreds of languages, or is it simply more appropriate to provide the means and motivation to WANT to know English? To strengthen our country by bringing people together to communicate and work in a more solidified union should be the goal. In essence, to make learning and knowing English a sought-after skill. The reality of today is that – unless you are a descendent of our Native Americans – and including the very Pilgrims who took land from the from our indigenous people, we are ALL from someplace else. 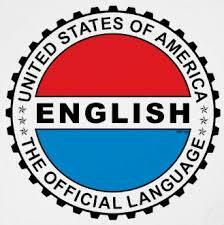 There was a time that coming to America was a dream come true, and learning English was part of that dream. English is how the shapers of this country wrote our most significant and essential works. And, I wonder if they had known then that people would emigrate to this land from far and wide with differing languages and cultures, if they would have done anything differently. To stand as one or fall divided. To me that means that declaring English as an official language would only strengthen us as a country. And, in no way do I wish to violate rights of those people with limited English in areas like court appearances – where – for the record, the right to an interpreter is merely implied in the constitution in the fifth, sixth and fourteenth amendment and – to the best of my knowledge – supplied by the government. Teddy Roosevelt summed up my feelings in a letter he wrote shortly before his death. “We have room for but one language here, and that is the English language…” Understanding the difficulties in communication when you do not speak the native language should be the impetus to learning it! The idea is to make wanting to learn English ‘a thing’. What I am hoping for is a time in history where English – as it serves us in commerce and trade not only nationally, but globally will once again be something to strive to learn when making this country a home. It has lost its luster over a few generations and we – as a country – are doing nothing to preserve and protect it. Throughout the world, people clamor to learn English as their second language to compete on the world stage of commerce and business. It is here, in America, that we seem to fight to discourage it or at the very least do not encourage it. This makes little sense to me. Instead of appeasing all the many different languages or worse, choosing one second language as more important than another, why not choose OUR language and provide ways for people to learn it. Is it the cost? Is the price tag to creating the infinite federal paperwork in countless languages not costly enough? I do see some differences for students. There is the growing use of dual language studies that clearly benefit their future and in fact teaches English while learning in a native language – costly – and is a separate conversation for another time. The reality is that multilingual is the wave of the future on a global scale. But we live here, in the United States of America. And, where English falls in popularity in the world doesn’t change the true benefits of English as our official language, right here. Adjusting to American civilization and greater communication and job opportunities are some of the pros to this official language idea. There is still the importance of national unity and identity, a by-product of an official language, which – if you watch the news – is on the decline of late. If you want a future in science, technical innovation, economic development and even the film industry you will more than likely require English. It is the adopted second language in Germany, Norway, Sweden, Denmark and the Netherlands. Yet here, we cannot seem to embrace it the way it should be embraced. Duolingo is the self-proclaimed most popular way to learn a language via online or via their app. With over 120 million users around the world – in 194 countries, they teach 19 languages. What I find most interesting from their data is that English is the MOST popular language in 116 countries. For perspective, the 2nd most popular language is French in 35 countries and 3rd is Spanish in 32. This is not hard science, since Duolingo has not offered Mandarin – which is now ranked #1 in the world. (Although I believe their technical capabilities are catching up with non-Latin alphabets.) What it does show is the demand at which the world wants to learn English. ‘The world’ seems to have a different view of English as compared to right here in the United States of America. That, to me, is pretty bleak. I hope that in my lifetime, we come together as a country in a singular, proud voice, and as we welcome new people to our American dream, we give them the tools and inspiration to learn the official language of their new home. My opinion, my thoughts, my views, my hope.